Police officers daily come into contact with an element of our society that most of us would choose to avoid. But career law enforcement officer and LeTourneau University alumnus Mike Bishop (2008 MBA) says his faith in Christ helps him remember that even people who commit crimes are human beings, God’s children, and they deserve to be treated with a measure of dignity and respect. 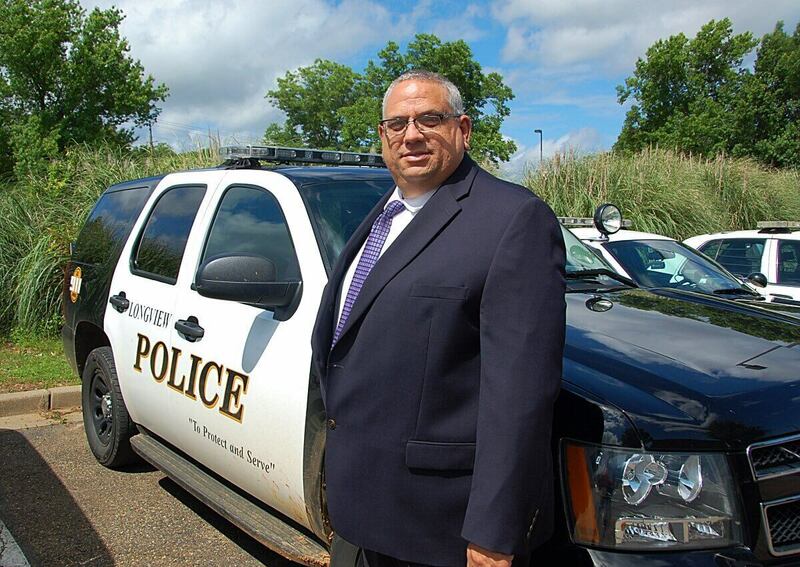 Bishop moved up through the ranks at the Longview Police Department from patrol officer to Chief of Police. In all that time, he said he has been blessed that he has never had to take a life in the line of duty. When Bishop graduated high school in 1983 in upstate New York, he wasn’t sure what he wanted to do with his life, but he knew he didn’t want to follow his parents into factory work in their hometown in Newfane, New York. Instead, he joined the Air Force and got his first taste of Texas heat at Lackland Air Force Base near San Antonio where he was presented with the career opportunity to pursue security police training. He served overseas doing flight line security overseeing four squadrons (about 150 aircraft) at the joint British/Royal Air Force Base in Upper Heyford, England. His next assignment landed him at Barksdale AFB in Bossier City as part of a Strategic Air Command. Honorably discharged in May 1989, he married his sweetheart, Amelia, and moved to Longview to work for the Longview Police Department. Bishop’s career was marked by growth and excellence. From patrol officer, police area representative and detective in the property division of the Investigative Services Bureau, he was promoted to sergeant in 2001, to lieutenant in 2003, to assistant chief in 2011, and to chief in 2015. He is a master police officer who has worked in crisis intervention (hostage negotiation) and internal affairs investigation and has received commendations over the years including a civic achievement award, meritorious conduct award and supervisor of the year award. “It was never on my radar screen that I would be an assistant police chief, but over the course of my career, opportunities presented themselves,” he said. His MBA in Human Resources Management from LeTourneau University has helped him manage people, programs, budgets and employee performance. His faith helps him do the job every day. Mike says that while he doesn’t share Christ by preaching on the job, he has had opportunity at times to share his faith when others have asked. His faith makes him more patient with others and more empathetic, especially with crime victims. “Having the ability to reach out and assist individuals in their time of need is important to me,” he said. For 15 years, he has been a member of American Business Clubs (AMBUCS), raising funds to provide wheelchair ramps, college scholarships for physical therapy students and Amtrykes for children with disabilities. He also serves on the board for the Miracle League of East Texas, raising funds to build a baseball field for individuals with special needs.